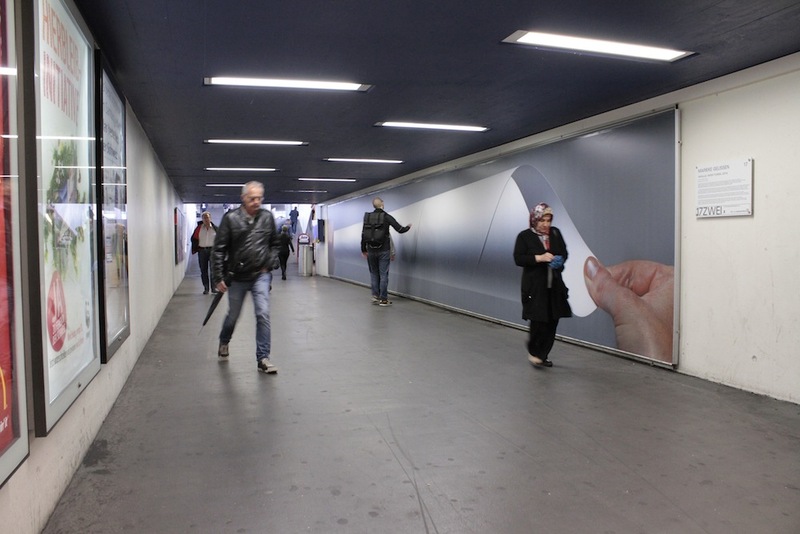 MAY 2014 // From May 27th 2014 Parallel Paper Tunnel was presented at 17ZWEI, a public exhibition wall in Station Hardbrücke in Zürich, Switzerland, initiated by Deutsche Bank and the Zürich Art Academy. It is an inkjet print on truck tarp, sized 1600 x 215 cm. The cone photograph was realized in collaboration with Gert Jan van Rooij. 17ZWEI is a collaboration between the Zurich Art Academy (ZHdK) and Deutsche Bank. 17ZWEI invites emerging artists to propose a work for this specific location. The 2013/2014 programme included works by Monika Drożyńska (PL), Hugo Orlandini (CU/ES), Idan Hayosh (IL/RO), Shahzad Ahmad Khan (PK) and Steven Emmanuel (GB/D). More info: www.db.com/switzerland. The photographs of this project were published in a booklet. 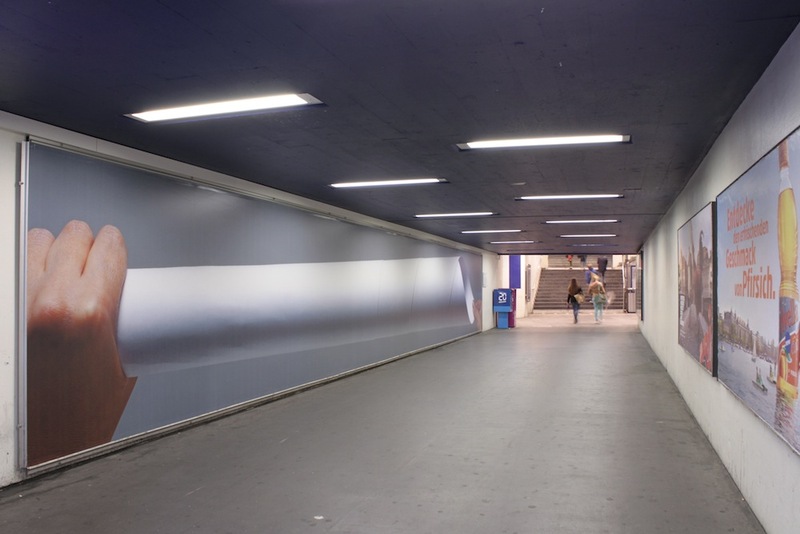 Parallel Paper Tunnel was published in a publication on site specific art. I find tunnels and underpasses fascinating in their sculptural appearance. That is where this works starts. 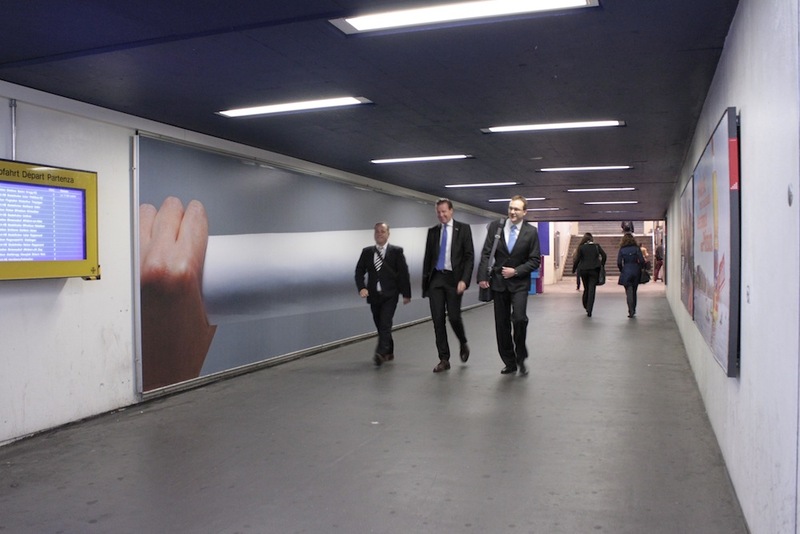 It starts from the space where 17ZWEI is located: an underpass, a tube, a tunnel. The experience of entering a tunnel resulted into a video work that I made earlier. This video shows two hands – my hands – holding both ends of a piece of rolled paper. Pulling on one end, the paper roll transforms into a conical shape. This action of pulling and letting go is repeated over and over again, in a steady rhythm, the rubbing of the paper providing a breathing soundtrack to it. The key moment in this action of pulling and letting go, is the moment when the paper roll has reached its limitations in being stretched. The paper has a conical shape, the opening of the cone is invitingly open, carefully held by the the two hands. It is this very moment that I wanted to capture in the work for 17ZWEI and to enlarge to the actual size of the tunnel: 16 x 2 meters. 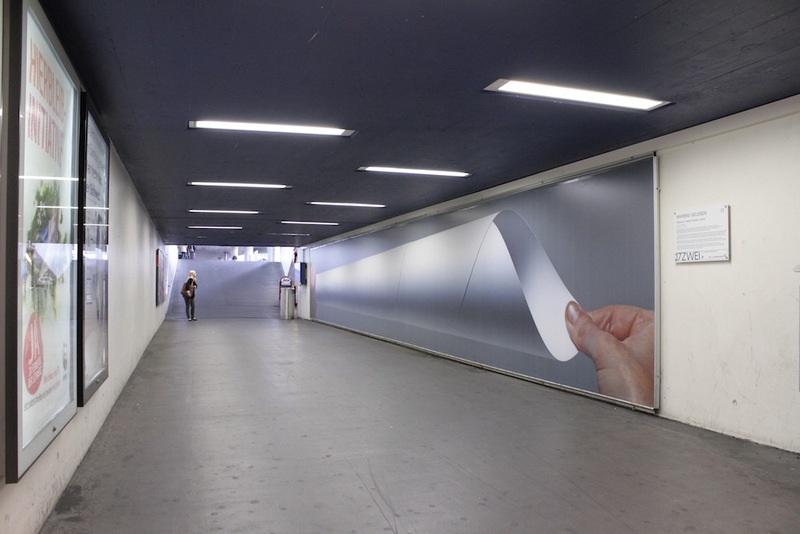 Thus creating a parallel paper tunnel along the underpass. 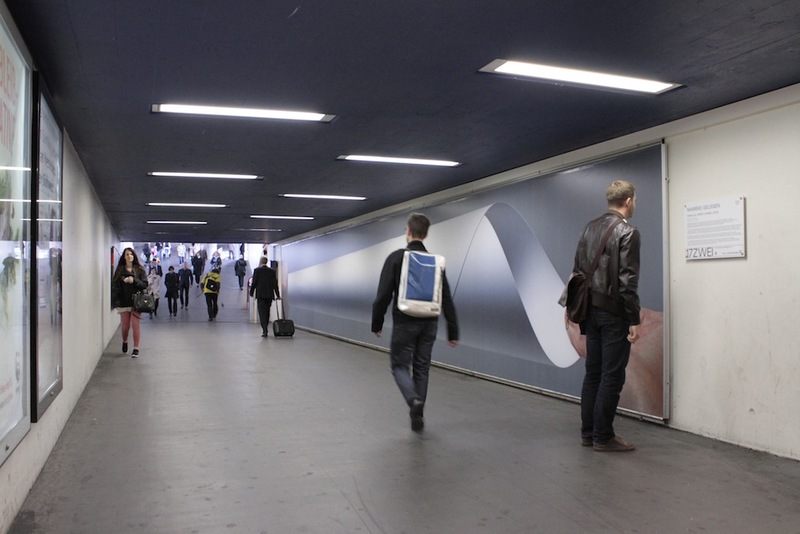 Since the work is installed on one of the long sides of the tunnel, the viewer perceives the image from a specific perspective. From one side, this perspective increases the conical form, while from the other side the conical shape is perceived as a tube. To see the work realized on this scale is thrilling: it enables the viewer to relate to the work in a physical way.